The book and video we used is by Ruth Haley Barton and subtitled: Arranging Our Lives for Spiritual Transformation. The whole weekend was just - wow! It's still hard for me to put into words and I keep saying that and yet...here I am wanting to write about it. One of the points we read/discussed was honoring the body. How can I glorify God in my body? In order to do that, we must learn how to listen to our bodies and begin to treat our bodies like the temple of God, which they are. How can we bring others to Him if we're limping around not enjoying life? It's time for us to eat our veggies, ya'll. Put away the potato chips and maybe bake some kale? The author didn't say this - I'm ad-libbing. But honestly, this is what's helped me feel so much better. Eating fruits and vegetables - making cauliflower pizza instead of the 'cardboard' stuff, as my husband says. and getting active has helped me get in tune with my body. I was sick for so long, and being active and stretching myself is how God speaks to me. I never thought I would enjoy riding my bike for 30 plus miles or enjoy doing yoga or cardio with a 29 year-old friend who pushes me. At the end of the retreat, while every one else was enjoying the fireplace and talking, I put on a few layers of clothes and went outside in our late-in-the-year-snow and plopped down in front of the big picture window and made a snow angel. and then I looked up at the sky - my God-given blue eyes connected to the clear blue sky. For a few minutes or five or ten, I don't really know how long it was, I experienced the God who brought this late in the year snow. Such a big big sky, and me, so little on a huge expanse of earth. 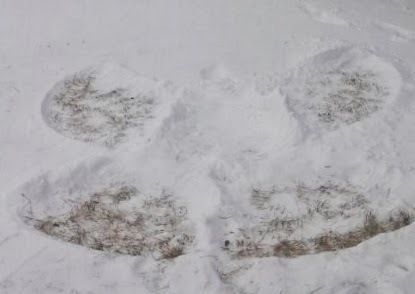 to meet with me for that little bit of time inside a snow angel? I ventured outside where no one else dared and He, Abba Daddy, met with me. A couple of years ago, that wouldn't have happened. I would have stayed inside, warm. Now, I love stretching myself to do new things. Experience new adventures. It's one way God speaks to me and it's okay. I don't have to sit with my Bible and continually feel bad because I seem to be learning impaired. We all listen and learn in different ways. There is a time and place for studying God's Word, of course, but the more I spend with Abba - the more I want to spend with Him in every way imaginable, and that includes getting into His Word - you see? And I've had times in my life where I've done that. Right now it's a dry spell. He's waking me up. My eyes were wide-open looking up into that great expanse of sky - into the Heavens and that experience is still very real to me even now. God just now plopped this verse into my mind and I Googled to find where it was found in the Bible. I'm not as learning-impaired as I make myself out to be, I suppose. But the more we attempt to spend time with God, our ways will hopefully align with God's ways a little bit better. Our thoughts will mesh with His and hopefully we will have many more meetings. That's my wish; my yearning...many many more. Snow angels actually are my WA friend's thing. It's her birthday today (Sunday) and I just had to make her a snow angel, but God had a different plan. to look into my eyes. If I hadn't gone outside to do something so silly like make a snow angel, would I have had my personal God-encounter? Would He have met me in a different way? I don't know. I wonder how many other encounters with God I've missed because I wasn't in tune with Him. So that's what this retreat was all about. Learning how to find our own rhythm that works for us to come close to God. I guess mine is listening to God in a snow angel, huh? And now I'm eager for lots more encounters in my days.